F&F Postcard Return – Homecoming! 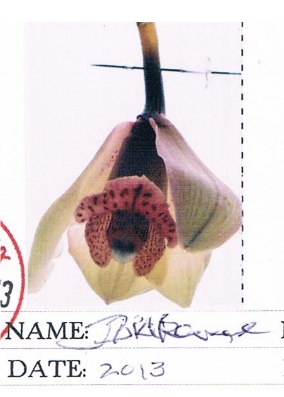 Thank you to everyone who has continued to send me updates on their F&F Postcards since my last post. I owe a backlog of ‘thank you’ postcards & zines and am struggling to catch up. 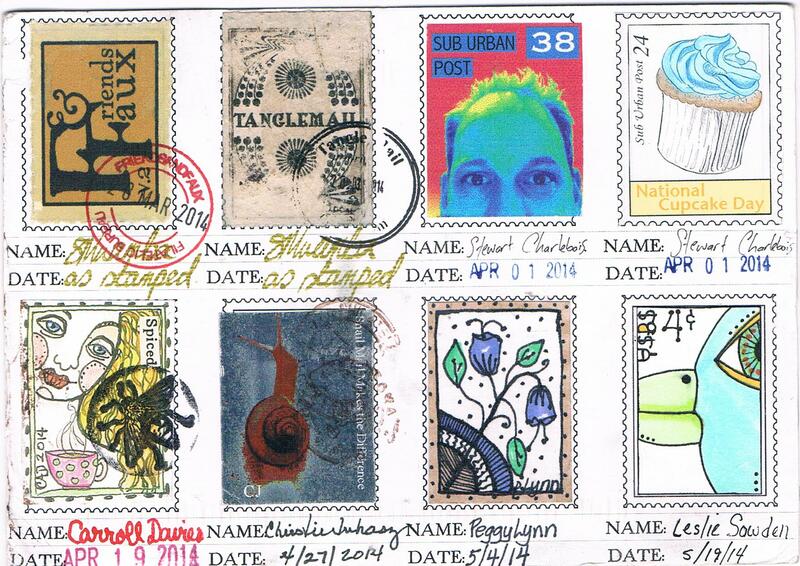 Update March 2018: If you are a fan of mail art and postal crafts, please check out my updated website for details of my current stamp art projects. Apologies for recent lack of updates to the blog. Although some update pics have been received, I am currently struggling to make time for regular posting around other commitments. Hopefully normal service will resume in the near future. Please bear with me! F&F #85.7 – another homer! 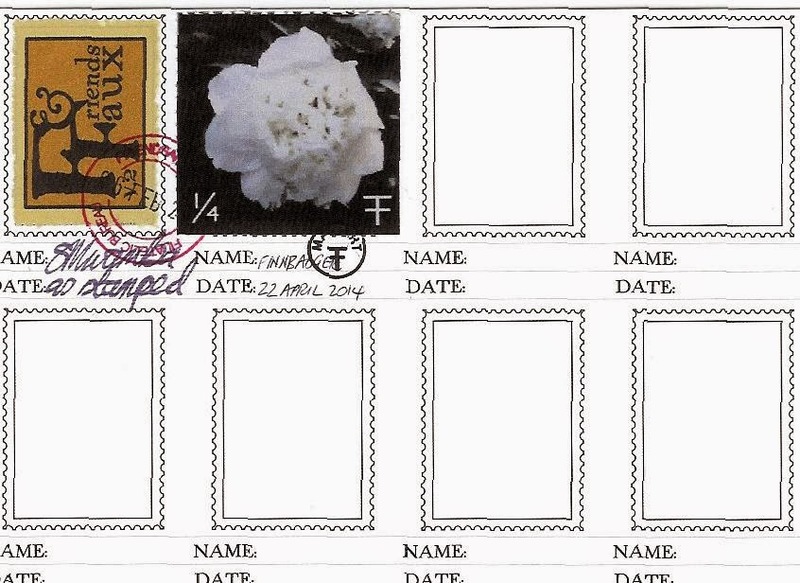 F&F #85 accompanied Penelope Harris (artistamp 3) and Rose Momsen (artistamp 7) to an art retreat in Canada and collected its full complement of faux postage in one sitting from mostly Canadian and a couple of American contributors. Some beautiful work here! F&F #71 began its journey with Stewart Charlebois in Canada then travelled a few of the United States before heading back home to Derby (UK) – showing a little wear & tear, but lots of character! 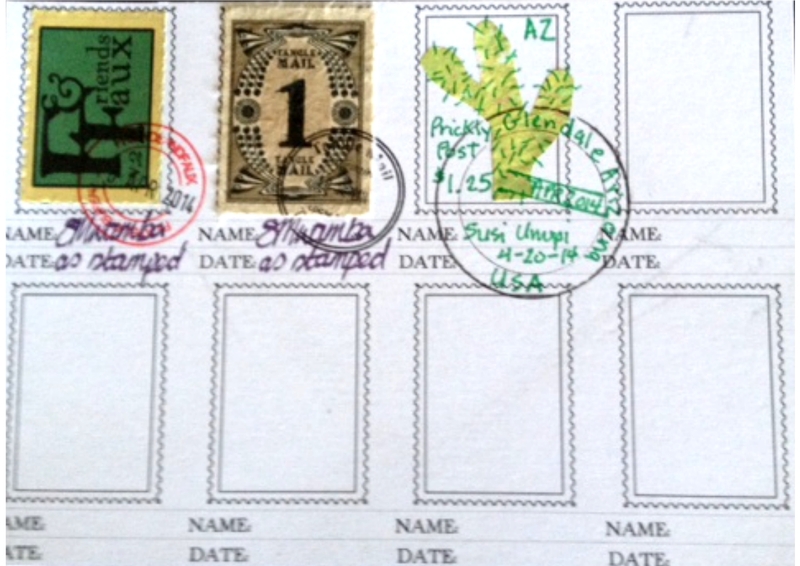 5 Friends & Faux Postcards were sent out (from an overall total of 110), travelling to the Netherlands, and USA. 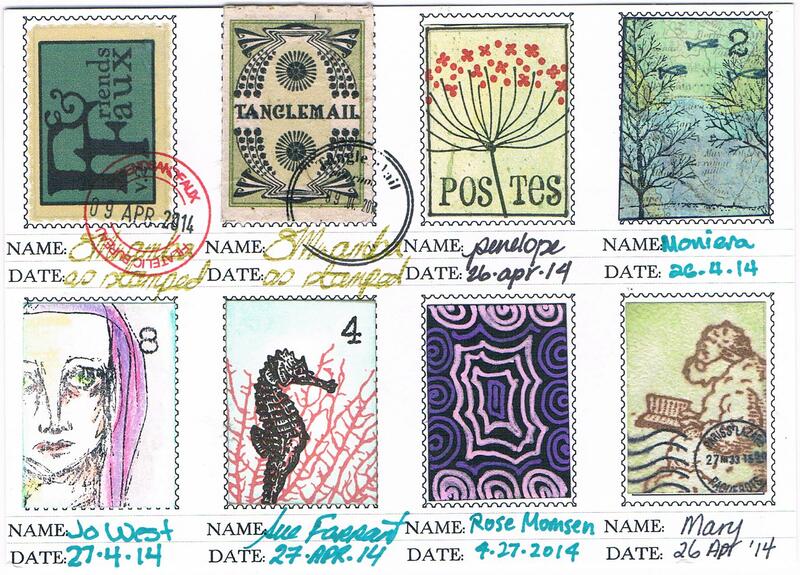 …and @TangleCrafts on Twitter has been featuring a daily Artistamp of the Day, from the Friends & Faux archive – this will be ongoing for a while longer. I’m afraid the admin of keeping on top of all the all the updates has been escaping me a little lately, so I’m currently working on ways to streamline the process. Please bear with me if you send in an update – I will get back to you! 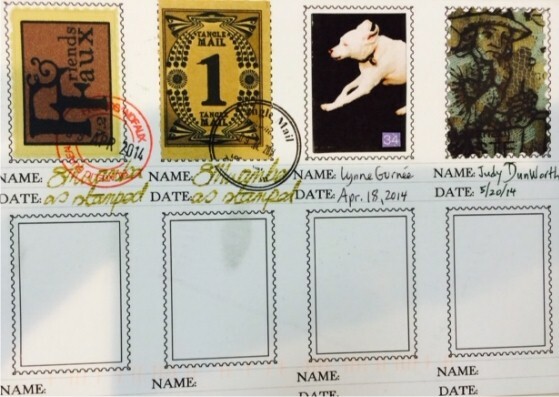 If a Friends & Faux Postcard passes through your hands, please submit a tracking form to help us track where it has been & where it is going next! F&F #25.7 – another homer! Welcome to the Friends & Faux Mail Art Project! 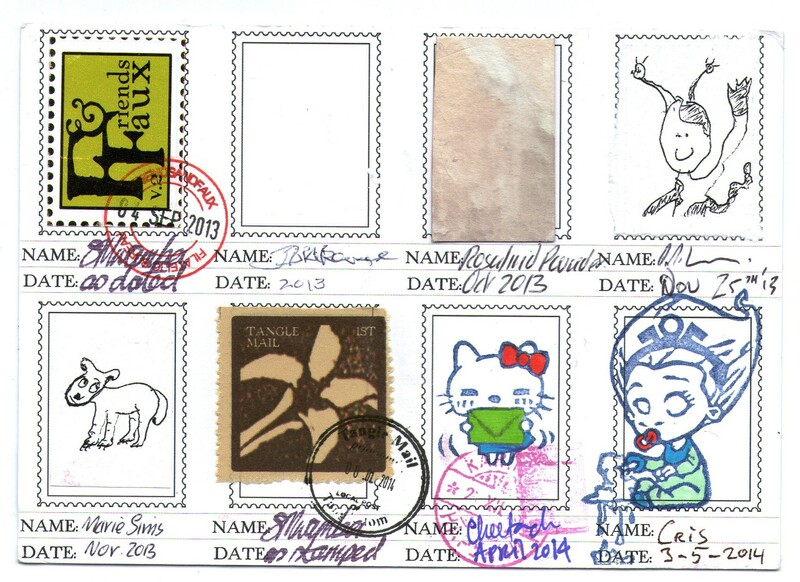 With your help, we will be travelling around the world in artistamps, and the F&F blog will log as many stages of that journey as possible. tanglecrafts on F&F #71.7 – homer! Carroll Davies on F&F #71.7 – homer! FinnBadger on F&F #71.7 – homer!